I love Jamie Oliver. He always has a passion for his food and fresh ingredients. He really gets moving in the kitchen using his hands to knead bread or using his hands to grind up fresh spices with his mortar and pestle or using his hands to pick out some fresh herbs. He is a real hands on kind of passionate chef and I quite like that. Several years ago, my sweet little husband purchased a copy of Jamie Oliver's cookbook for my B-day and it has been laying in the storage facility for years whilst we have been living abroad. However on a last trip home, my cookbooks have been finally retrieved from the storage unit and are on my shelves in Hong Kong. There is something very magical about sifting through the pages with your fingers of a real cook book with lots of amazing photos. This is something I have not done in years and I forgot how much I loved it. My teenagers love to do this as well and they proceeded to tag a few pages from each the cookbook that they wanted me to make in Bam's Kitchen. 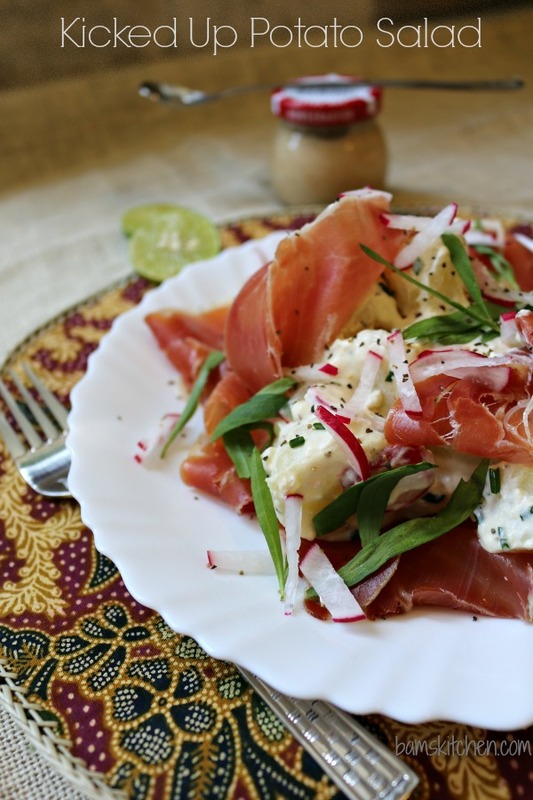 One recipe that I found quite interesting was Jamie Oliver's "Amazing Potato and Horseradish salad with fine herbs and bresaola" on page 30 of his "Cook With Jamie-My guide to Making You a Better Cook" cook book. 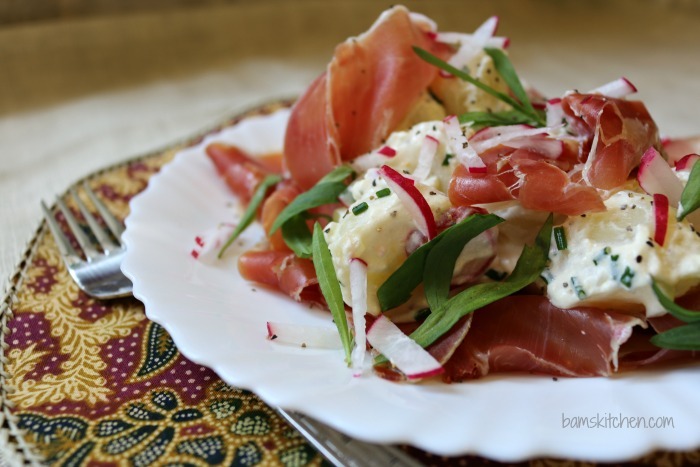 Fresh tarragon is not a herb that I cook with often and this really sparked my interest. Fresh tarragon is very aromatic and has a slightly bittersweet flavor and an aroma similar to that of anise. I love cooking with fresh herbs and essences such a citrus as it really adds another dimension of flavor, color and texture to so many dishes. I started to make the dish and realized that I did not have all the items on hand so made a couple of adjustments along the way. (I know your shocked...wink wink...and smiling as when do I ever have on hand all the ingredients. I am the queen of substitution) I only had stalks of celery and no celery leaves so instead I added some slices of radishes that really perked up the dish. In addition, we cannot find fresh plain horseradish anywhere here in Hong Kong only this odd horseradish like sauce. The horseradish sauce from the UK was just brilliant in this dish. I also used limes instead of lemons as this is what I had on hand. I also used chives instead of parsley and small baby red potatoes instead of new potatoes. 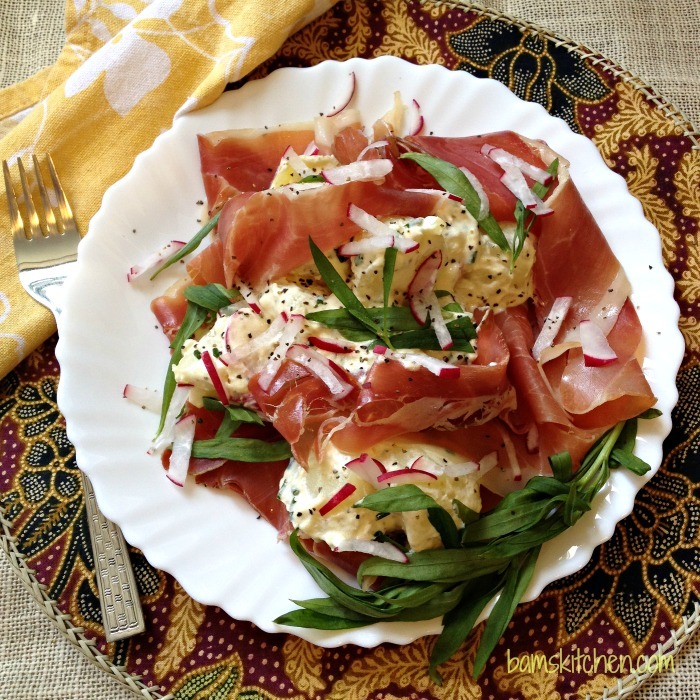 I used proscuitto ham instead of bresaola. However, technically it was still the same dish with Jamie's basic concepts and flavors. I actually could not believe my eldest requested this dish as my boys do not usually like anything with mayo or cream in it. However, all I could get out of the finished dish was one bite so I could report back to you with my findings. I think Jamie got his servings wrong as it obviously only feeds one hungry teenager, maybe 4 adults if there was any of it left... You know that says something more than positive when picky teenagers like a dish, you know it has to be good. 1Boil the red potatoes in salted water for about 10-15 minutes or until fork tender. Drain salt and pepper while they are still hot to taste. Set aside. 2In a bowl, mix the lime juice, horseradish sauce, sour cream and chives. Season with salt and pepper to taste. Add the potatoes whilst still hot to the horseradish dressing, chives and delicately stir. Taste and adjust seasonings as required. Cool in refrigerator. 3Plate your potato salad. Place your potato mixture on a plate. 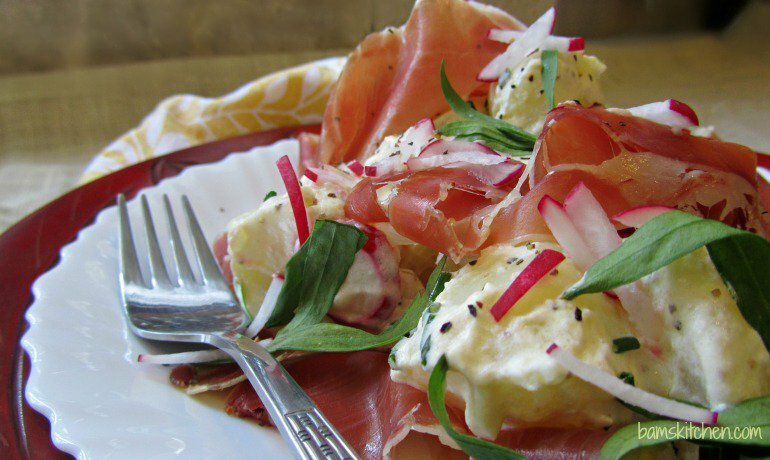 Delicately place the proscuitto along the potatoes. 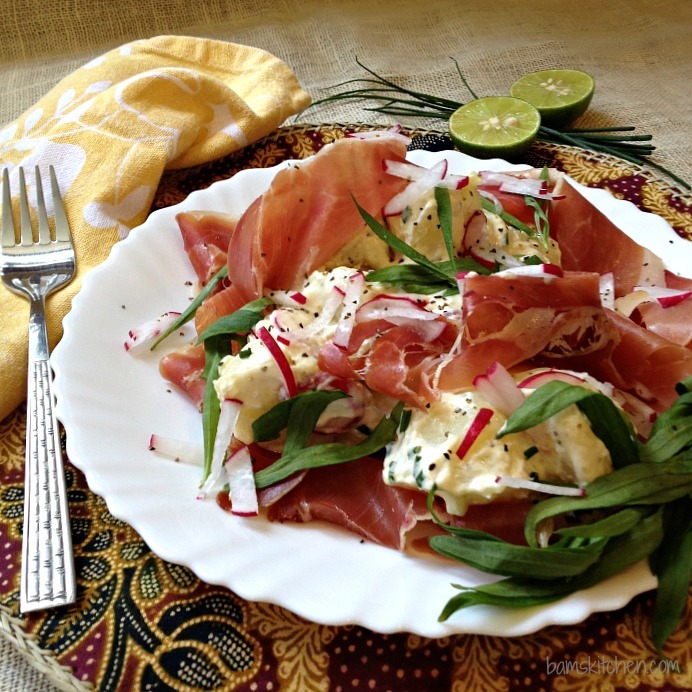 Top with torn tarragon leaves, sliced radishes and a drizzle of olive oil and enjoy.